We are an interdisciplinary research group investigating condensed matter materials behaviors under extreme pressure-temperature conditions. In our research, we utilize modern static and dynamic high-pressure technologies coupled with the state-of-the-art laser spectroscopy at the WSU, as well as the x-ray diffraction and x-ray spectroscopy at national third-generation synchrotron facilities. At the pressure-temperature conditions that can be found in the Earth and planetary interiors, we exploit novel states of matter and new phenomena, not present at ambient conditions, and learn how materials establish new Periodic orders with completely redefined chemical and physical properties. 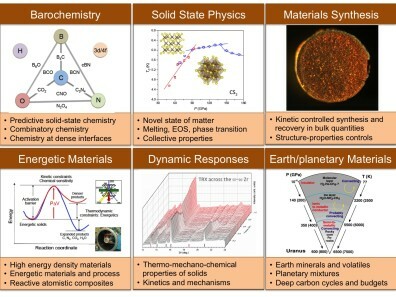 We are interested in a wide range of materials, which include simple molecular solids, covalent and ionic solids, f-and d-transition metals and alloys, as well as functional materials such as reactive nanoparticles, hydrogen storage materials, strongly correlated systems, and high energy density solids. April 2017: Austin, Junior in Physics at WSU, has attended and presented a poster on Reactive Materials at the Naval Engineering Education Consortium (NEEC) on April 26-27, Washington DC and toured the Naval Norfolk Center. He is also selected as a Summer Intern at the NSWC for ten weeks in this summer. Congratulation Austin, job well done! Feb 2017: Sakun has received the best poster award at the 2017 NNSA-SSAA workshop (2017), April 12-13, 2017 in Chicago, IL Good Job – Sakun! Dec. 2016: Young-Jay on the 2016 Commencement: Congratulation to Young-Jay for his graduation with PhD in Materials Chemistry. Also, congratulate him for getting a job at the GSE CARS at the APS, the University of Chicago. Best wishes for him and we look forward to continuing our interaction with him at the GSECARS. On the 2015 Commencement, a brand new “explosive” doctor Mihindra Dunuwille (PhD in Chemistry, 2015) gets a recognition from the DHS-ALERT Community. On the 2014 Commencement, from the left, three brand new “extreme doctors” Dane Tomasino (PhD in Chemistry, WSU), Gus Borstad (PhD in Physics, WSU), and Ranga Dias (PhD in Physics, WSU) enjoy their moment with their advisor Prof. Yoo. 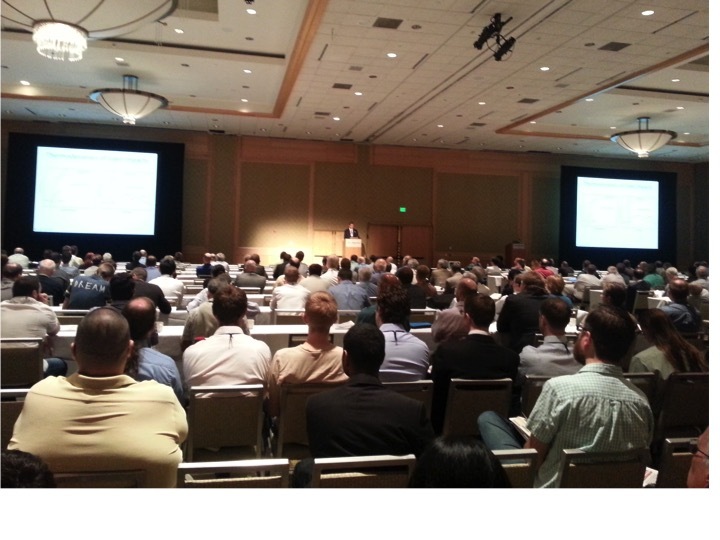 At the 2013, Joint AIRAPT and APS-SCCM Conference, held in Westin Hotel in Seattle, Washington, co-chaired by Drs. 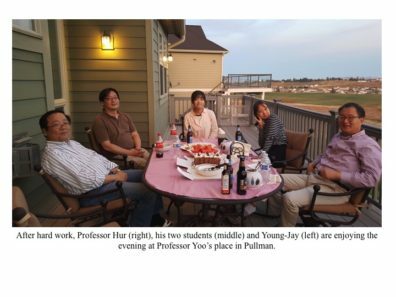 Rip Collins at LLNL, Dave Moore at LANL, and Choong-Shik Yoo at WSU, July 7 – 12, 2013. Over 700 scientists including ~120 graduate students were participated in the conference. Early Group members in June, 2008: From the left, Joeseph Lanska, Amartya Sengupta, Minseob Kim, Jing-Yin Chen, Mahindra Dunuwille, Choong-Shik Yoo, and Raymond Clay. August 2017: Participated in the AIRAPT Conference, Aug. 19-22, 2017, Beijing, China. Sakun has received the student travel support and provided an invited talk on Photochemistry on Sulfur Containing Materials, and Dr. Yoo has organized a focused session on High Energy Density Materials and presented an invited talk on High Energy Density Materials. August 2017: New graduate students have joined the group, including Brittany Thiessen (Chem GS), Karissa Jensen (Chem GS), Alex Howard (MSE GS), and Kevin Fernandez (Chem GS). Also, a new undergraduate student Jessica Groven (Junior in Physic) has joined the group. Welcome all!! July 2017: Received a new grant from the ARO/ARL for studies of Dense Carbon-based Framework Structures. We thank the Sponsor Program Director and look forward to productive research in coming years. We also welcome collaborative opportunities with scientists at the ARL. June 2017: Received a new grant from the NSF-DMR for studies on Multi-functional Materials under High Pressure. Very exciting, we look forward to productive research in coming years. 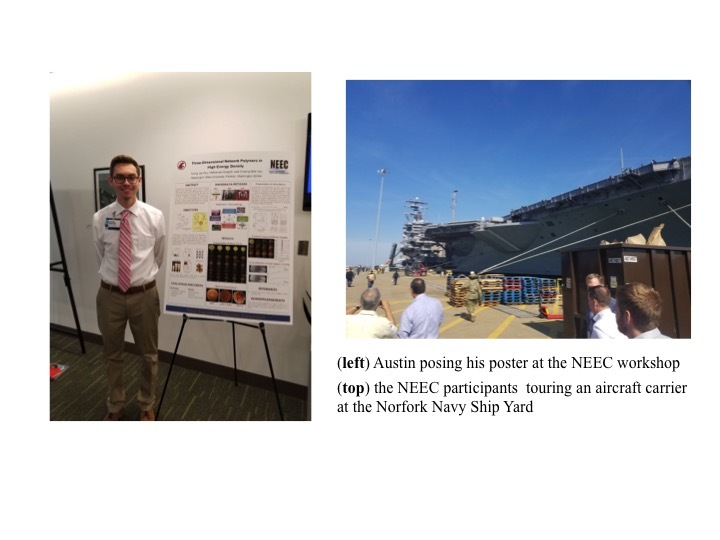 April 2017: Austin, Junior in Physics at WSU, has attended and presented a poster on Reactive Materials at the Naval Engineering Education Consortium (NEEC) on April 26-27, Washington DC and toured the Naval Norfolk Center. He was also selected as a Summer Intern at the NSWC for ten weeks in this summer. Congratulation Austin, job well done! April 2017: Dr. Yoo presented an invited talk on High Energy Density Material at the MRS-Spring meeting, April 17-21, Phoenix, Az. April 2017: Participated in the 2017 March Meeting. Dr. Yoo presented an invited talk on Barochemistry, and Sakun, Minseob, YoungJay, and Jinhyuk presented their contributing talks on their research topics. March 2017: Received a new grant from the DTRA for Plasma Chemistry and Nuclear Forensics. Very exciting, we look forward to productive research in coming years. Feb 2017: Sakun has received the best poster award at the 2017 NNSA-SSAA workshop (2017), April 12-13, 2017 in Chicago, IL Good Job – Sakun! 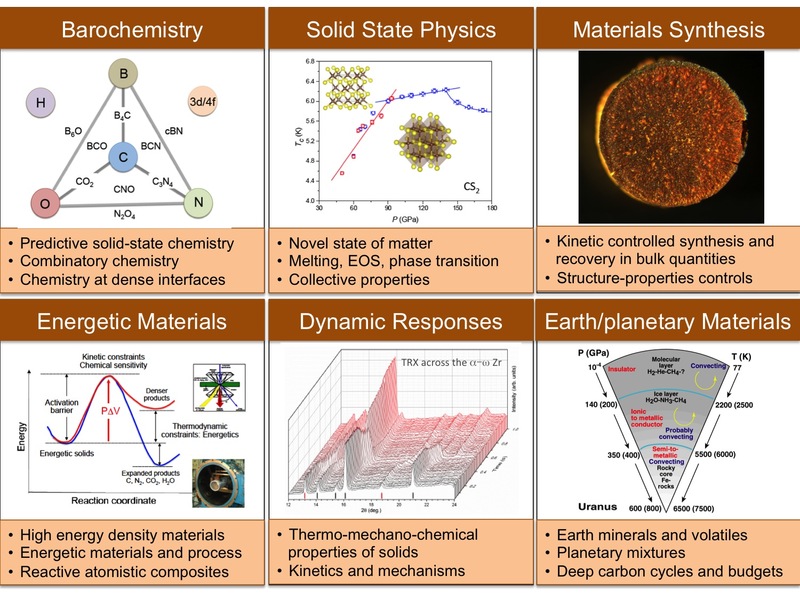 Sep. 2016: Three new grants have arrived for us to start our new projects in support of (i) ACS-PRF on Thermo-mechanical reaction of volatiles in deep earth’s environment, Sep. 2015; (ii) DOE-NNSA on Planetary materials under extreme conditions, Oct. 2015; (iii) DOD-NEEC on Three-dimensional network polymers for energy depository. We thank for the support and look forward to wonderful research in these projects. Aug. 2016: Dr. Yoo presented an invited lecture on Insulator-Metal Transition in OCS and its analogy to CO2 and CS2, at 17th International Conference on High Pressure in Semiconductor Physics, University of Tokyo, Japan. Aug. 2016: Professor Hur and his students at Sogang Univ in Seoul, Korea visited us to perform high-pressure experiments on energetic materials. (Aug. 21 – 26). June 2016: Participating in Gordon Research Conferences on High Explosives (June, 2016) and High Pressure (July, 2017). Dr. Yoo gave an invited talk at the GRC-HE on High Energy Density Solids and chaired the HP-Chemistry session at the GRC-HP. Young-Jay, Sakun, and Jin-hyuk has presented the invited posters in the meeting. 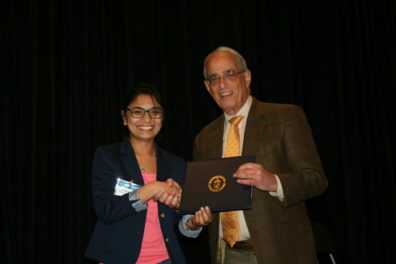 June 2016: Sakun has received a few awards in this year, including (i) the Golding Family Graduate Fellowship (2016) for her academic and research accomplishments; (ii) the NASA Space Grant Scholarship (2016); Dr. T. J.Chow Graduate Fellowship in Chemistry (2015) in recognition of academic achievements and the promise for continued professional development. Congratulation Sakun! Aug. 2015: Welcome to two new PhD graduate students, Joseph Hong and Mehdi Hamid, who just joined the Yoo group in 2015. Sep. 2015: A new ACS-PRF grant arrived for the research on Thermo-Mechanical Reactions of Volatiles in Deep Earth Environments: Formation and Evolution of Abiotic Hydrocarbons (PI, Yoo, FY2015-2017) . 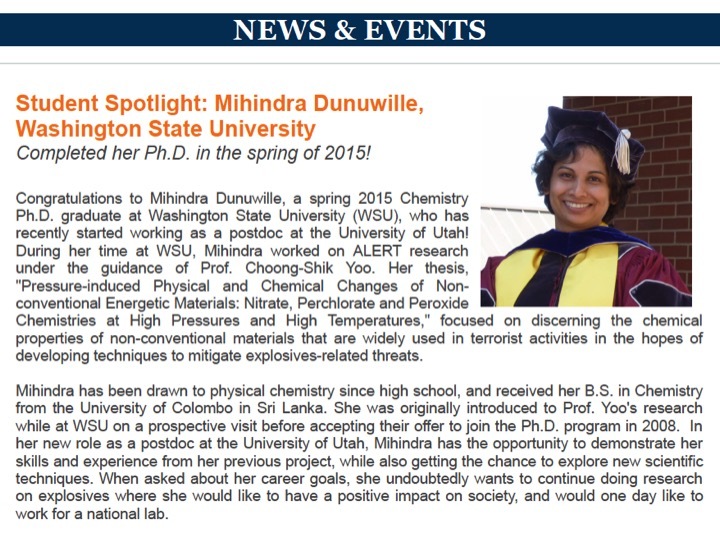 May 2015: Congratulation for a brand new doctor, Mihindra Dunuwille, PhD. Chem. WSU (2015). She is heading to University of Utah for continuing high-pressure research in this summer. Dec. 2014: Just published a new paper by D. Tomasino, M. Kim, J. Smith, and C. S. Yoo on Pressure-induced symmetry lowering transition in dense nitrogen to layered polymeric nitrogen (LP-N) with colossal Raman intensity in Phys. Rev. Lett. 113, 205502 (2014). May 2014: Congratulation to Dr. Dane Tomasino, PhD. Chem. 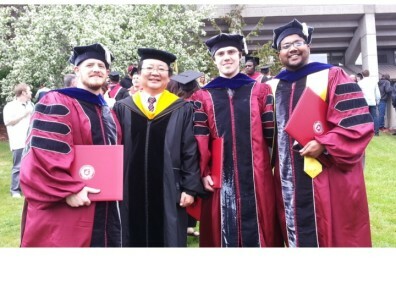 WSU 2014. He is moving to Intel Co, Portland, OR. May 2014: Congratulation to Gus Borstad, PhD. Phys. WSU, 2014. He is heading to Army Research Laboratory, Aberdeen, NY. Feb. 2014: Congratulation to Dane Tomasino, receiving the NNSA Outstanding Poster Award, presented at the 2014 SSAP Symposium; Materials under Extreme Conditions. 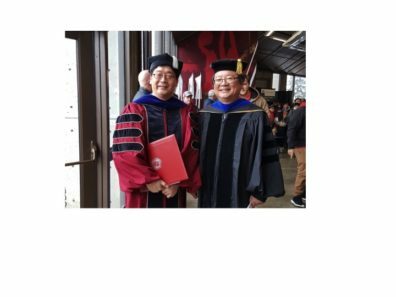 June 2014: A new ARO grant arrived for the research on Dynamic Response of Reactive Metals (PI- Dr. Yoo, FY2014-2017). Dec. 2013: Congratulation to Dane Tomasino, receiving the NASA Grant Fellowship through College of Arts and Sciences at WSU. July 2013: The DTRA reported our discovery of superconductivity in dense carbon dioxide, as a Fundamental research highlight. July 2013: Dr. Yoo, together with D. Moore at LANL and R. Collins at LLNL, has organized, the 2013 Joint AIRAPT/APS-SCCM Meeting in Seattle, July 2013. The meeting was a great success with a large participation of 700 PhD scientists and 100 graduate students. May 2013: Congratulation for a brand new doctor, Ranga Dias, PhD in Physics, WSU (2013). He is moving to Harvard University to join the Lymann Laboratory. Feb. 2013: Just published a new paper by Ranga Dias, Choong-Shik Yoo, Viktor V. Struzhkin, Minseob Kim, Takaki Muramatsu, Takahiro Matsuoka, Yasuo Ohishi, and Stainislav Sinogeikin on Low-Temperature Superconducting Phase and Magnetic Ordering in Highly Disordered Carbon Disulfide under High Pressure, in Proc. Nat. Acad. Sci. 110, 11720 (2013). July 2012: A new NSF grant arrived for the research on Squeezing Simple Molecules to Novel Conducting Polymers (PI- Dr. Yoo, 2012 – 2016). July 2010: Our research on xenon disulfide was highlighted as Use Super-High Pressures to Create Superbattery, WSU New Release, July 2 (2010), written by Eric Sorensen. This news triggered a large number of reports internationally in US and aborad for several months. August 3, 2009: Dr Jing-Yin Chen reported her findings of high structural stability of SWNT well beyond that of sp2 C=C bonds in graphite and carbon fullerenes in Chem. Phys. Lett, entitled High Structural Stability of Single Wall Carbon Nanotube under Quasi-Hydrostatic High Pressures. July 29, 2009: The General Assembly of the AIRAPT have voted at the AIRAPT-XXII in Japan, for Prof. Yoo to host and chair the 2013 AIRAPT-XXIV conference in Seattle. The AIRAPT is the International Association for the Advancement of High Pressure Science and Technology with over 1000 memberships throughout the world. July 22, 2009: Dr. Amartya published his discovery of new extended carbon dioxide phase in Phys. Rev. B, entitled Raman Studies of Novel Molecular-to-Nonmolecular Transitions in Carbon Dioxide at High Pressures and Temperatures. July 15, 2009: Dr. Yoo received the second year funding from DHS-Alert (504928) for studies of Chemical and Shock Mitigation of Nonconventional Explosive. May 12, 2009: Congratulation to Mihindra Dunuwille, who just won the Dodgen Award for the best Physical Chemistry and Materials Science Seminar in 2008-2009. May 4, 2009: Dr. Yoo awarded a three-year grant from the Defense Threat Reduction Agency (DTRA; BRBAA08-E-2-0059) to explore Novel Functional Extended Solids at Extreme Conditions. Three recently joined group members: from the left, Ranga Diaz, Mathew Debessai, and Gus Borstad. Welcome and go Big on your dream! March 24, 2009: Dr. Mathew Debassei joined the group from Prof. J. Schilling’s Group in Washington University, Saint Louis, MO. He will be taking on the project related to insulator-metal transitions in functional transition metals and compounds. March 16, 2009: Several group members presented their research results at the 2009 APS_March meeting in Pittsburgh, PA, March 16-20, 2009. Feb. 1, 2009: Mr. Gus Borstad, a graduate student in Physics Department, joined the Group. He is working on understanding high-pressure behaviors of simple binary molecular mixtures. January 9, 2009: Drs. Yoo and Chen attended the 2nd Global-COE forum at Kumamoto University, Kumamoto, Japan, and presented lectures, respectively, on Solid State Transformations in Extreme Conditions and on Chemical Transformations of CN Compounds at High Pressures. December 15, 2008: Congratulation to the WSU-SRI-SWRI team who just won a multi-year project from the DARPA for the research on Reactive Material Structure. The team consists of five co-PI’s: Atakan Pekar, Yogendra Gupta, and Choong-Shik Yoo from WSU, James Gran at SRI, and Gordon Johnson at SWRI. Aug. 5, 2008: Two talented REU students, Raymond Clay and Joe Lanska, have completed their summer projects on high-pressure materials research.